*Actual distance to center field is 400 ft (122 m); the 395-foot (120 m) markings are to the left and right of dead center. 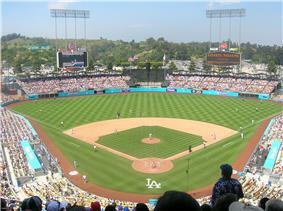 Dodger Stadium, occasionally referenced by local sportscasters with the metonym Chavez Ravine, is a stadium in Los Angeles. Located adjacent to Downtown Los Angeles, Dodger Stadium has been the home ballpark of Major League Baseball's Los Angeles Dodgers team since 1962. Dodger Stadium was constructed from 1959 to 1962 at a cost of $23 million, financed by private sources. Dodger Stadium is currently the third-oldest ballpark in Major League Baseball, after Fenway Park in Boston (opened in 1912) and Wrigley Field in Chicago (opened in 1914) and is the largest MLB stadium by seat capacity. Often referred to as a "pitcher's ballpark", the stadium has seen 11 no-hitters, two of which were perfect games. The most recent no-hitter was thrown by Clayton Kershaw of the Dodgers on June 18, 2014 against the Colorado Rockies. For the first time at Dodger Stadium, a soccer tournament featuring four clubs, the hometown team Los Angeles Galaxy, and European giants Real Madrid, Everton, and Juventus, were played on August 3, 2013, in a doubleheader. The field dimensions were from the third base side to right field, temporary grass was covered on the pitcher's mound and the infield. The tournament was a semifinal and Real Madrid defeated Everton 2-1 and Los Angeles Galaxy defeated Juventus 3-1. For the first time at Dodger Stadium, the Los Angeles Kings and Anaheim Ducks played a regular season game on January 25 as part of the NHL Stadium Series. In the mid-1950s, Brooklyn Dodgers team president Walter O'Malley had tried to build a domed stadium in the New York City borough of Brooklyn, but was unable to reach an agreement with city officials for the land acquisition, and eventually reached a deal with the city of Los Angeles in California. The land for Dodger Stadium was purchased from local owners and inhabitants in the early 1950s by the city of Los Angeles using eminent domain with funds from the Federal Housing Act of 1949. The city had planned to develop the Elysian Park Heights public housing project, which included two dozen 13-story buildings and more than 160 two-story townhouses, in addition to newly rebuilt playgrounds and schools, and a college. Los Angeles-based Mike Davis, in his seminal work on the city, City of Quartz, describes the process of gradually convincing Chavez Ravine homeowners to sell. With nearly all of the original Spanish-speaking homeowners initially unwilling to sell, developers resorted to offering immediate cash payments, distributed through their Spanish-speaking agents. Once the first sales had been completed, remaining homeowners were offered increasingly lesser amounts of money, to create a community panic of not receiving fair compensation, or of being left as one of the few holdouts. Many residents continued to hold out despite the pressure being placed upon them by developers, resulting in the Battle of Chavez Ravine, an unsuccessful ten-year struggle by the residents to maintain control of their property. The controversy surrounding the construction of Dodger Stadium provided the inspiration for singer Ry Cooder's 2005 concept album, Chávez Ravine. Dodger Stadium was the first Major League Baseball stadium since the initial construction of the original Yankee Stadium to be built using 100% private financing, and the last until AT&T Park opened in 2000. Ground was broken for Dodger Stadium on September 17, 1959. The top of local ridges were removed and the soil was used to fill in Sulfur and Cemetery Ravines to provide a level surface for a parking lot and the stadium. A local elementary school (Palo Verde) was simply buried and sits beneath the parking lot northwest of third base. A total of eight million cubic yards of earth were moved in the process of building the stadium. 21,000 precast concrete units, some weighing as much as thirty-two tons, were fabricated onsite and lowered into place with a specially built crane to form the stadium's structural framework. The stadium was originally designed to be expandable to 85,000 seats, simply by expanding the upper decks over the outfield pavilions. However, the Dodgers have never pursued such a project. 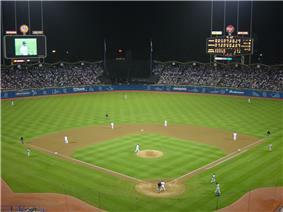 Between 2003 and 2005, Dodger Stadium upgraded with light emitting diode (LED) video displays. 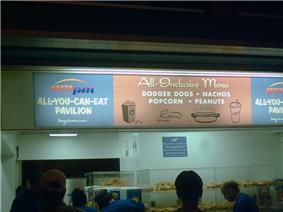 The large main video display measures 27 feet high by 47 feet wide. Top of the Park - The Green Necklace connects to a large scale outdoor plaza featuring breathtaking 360 degree views spanning the downtown skyline and Santa Monica Bay, the Santa Monica and San Gabriel Mountains, and the Dodger Stadium diamond. In the 2008–2009 offseason, the upper levels of the stadium were supposed to be renovated to match the repairs and improvements made to the field level. The improvements were to include the removal of the trough urinals in the men's restrooms, new concession stands and earthquake retrofitting to the concrete structure. It was also to include the replacement of the outfield scoreboards and monitors with new HD monitors. Due to the 2009 World Baseball Classic hosted at Dodger Stadium, these renovations were put on hold. As of the 2010 season, however, the scheduled renovations are still on hold. The divorce of Frank and Jamie McCourt, as well as a weak economy, are the reasons for the postponement. In pay for an outstanding loan with the Dodgers former owner News Corporation, former owner Frank McCourt used Dodger Stadium as collateral to obtain a $250 million loan. Two of Dodger Stadium's most distinctive features are the wavy roof atop each outfield pavilion and the top of a ten-story elevator shaft bearing the Dodger logo rising directly behind home plate at the top of the uppermost seating level. Built in the Los Angeles community of Chavez Ravine in Solano Canyon, the stadium overlooks downtown Los Angeles and provides views of the city to the south, the green tree-lined hills of Elysian Park to the north and east, and the San Gabriel Mountains beyond the outfield pavilions. Due to dry summers in Southern California, rainouts at Dodger Stadium are rare. Prior to 1976, the Dodgers were rained out only once, against the St.Louis Cardinals, on April 21, 1967, ending a streak of 737 consecutive games without a postponement. On April 12, 1976, the second home rainout ended a streak of 724 straight games. April 19–21, 1988 saw three consecutive rainouts, the only time consecutive games have been rained out at Dodger Stadium. No rainouts occurred between April 21, 1988 and April 11, 1999 - a major league record of 856 straight home games without a rainout. With the retirement of the original Yankee Stadium (1923) and Shea Stadium in 2008, the park claimed the title of being the largest capacity stadium in the Majors. Due to renovations made in the 2012-2013 off season, the current maximum capacity of Dodger Stadium is less than 56,000, although the team's president, Stan Kasten, refuses to provide an exact number. A 53,393 attendance is considered a sellout. The team's 2013 media guide and website still report the capacity as 56,000. The record attendance for the Dodgers was in the 2007 season, with 3.86 million in total attendance. For various reasons, Dodger Stadium has long enjoyed a reputation as a pitchers' park. At first, the relatively deep outfield dimensions were a factor, with the power alleys being about 380 feet. Home plate was moved 10 feet toward center field in 1969, but that move also expanded foul ground by 10 feet, a tradeoff which helped to offset the increased likelihood of home runs caused by the decreased field dimensions. Also, during evening games, as the sun sets, the surrounding air cools quickly due to the ocean climate, becoming more dense. As a result, deep fly balls that might otherwise be home runs during the day instead often remain in play becoming outs. The park has been home to 11 no-hitters, while players have hit for the cycle just twice in Dodger Stadium. With the opening of Citi Field and the demolition of Shea Stadium in 2009, Dodger Stadium became the only stadium with symmetrical outfield dimensions remaining in the National League and only one of four total in Major League Baseball. The other three symmetrical fields are Kansas City's Kauffman Stadium, Toronto's Rogers Centre, and Oakland-Alameda County Coliseum, all in the American League. The Dodgers won the 1963 World Series over the New York Yankees, sweeping the Yanks by winning game 4 by a score of 2-1. Through 2013, this remains the only time the Dodgers ever clinched a World Series at home. Four home runs have been hit completely out of Dodger Stadium. Outfielder Willie Stargell of the Pittsburgh Pirates hit two of those home runs. Stargell hit a 507-foot home run off the Dodgers' Alan Foster on August 5, 1969 that completely cleared the right field pavilion and struck a bus parked outside the stadium. Stargell then hit a 470-foot home run off Andy Messersmith on May 8, 1973 that landed on the right field pavilion roof and bounced into the parking lot. Dodger catcher Mike Piazza hit a 478-foot home run off Frank Castillo of the Colorado Rockies on September 21, 1997 that landed on the left field pavilion roof and skipped under the left field video board and into the parking lot. Finally, on May 22, 1999, St. Louis Cardinal first baseman Mark McGwire cleared the left field pavilion with a 483-foot home run off the Dodgers' Jamie Arnold. The Jacksons performed six sold-out concerts at Dodger Stadium on November 30 and December 1, 2, 7, 8 and 9, 1984 during their Victory Tour. Dodger Stadium was also the site of "Encore - the Three Tenors", a 1994 concert reuniting internationally renowned tenors Plácido Domingo, José Carreras and Luciano Pavarotti, conducted by Zubin Mehta. The parking lot of Dodger Stadium was used in the 2001 movie The Fast and the Furious, in which Brian O'Connor (played by actor Paul Walker) drifts his 1995 Mitsubishi Eclipse around the parking lot. Many of the world's top rock, pop and electronic bands have performed at Dodger Stadium, including acts such as The Cure, KISS, The Rolling Stones, The Beatles, Bee Gees, Elton John, Simon and Garfunkel, David Bowie, Genesis, Eric Clapton, Depeche Mode (2 Nights), U2 (2 Nights), Dave Matthews Band and Bruce Springsteen & The E Street Band. The Police played at Dodger Stadium on their reunion tour. ^ a b "2014 Dodger Season Tickets Go on Sale" (Press release). ^ a b c Lowry, Phillip (2005). Green Cathedrals. New York City: Walker & Company. ^ "Map--Diagram of proposed Dodger Stadium in Chavez Ravine - 1957." Los Angeles Examiner, 23 September 1957. http://digitallibrary.usc.edu/cdm/ref/collection/p15799coll44/id/91758 Retrieved October 16, 2013. ^ Hernandez, Dylan; Shaikin, Bill (April 25, 2008). "Stadium Makeover Is Unvieled". ^ Bloom, Barry M. (May 12, 2005). "Dodgers to Stay in Place for 25 Years". ^ Zavis, Alexandra (October 8, 2008). Dodgertown' Could Be Home Base"'". ^ Maddaus, Gene (August 6, 2012). 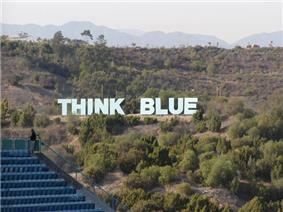 "Dodgers Hire Janet Marie Smith, Star Stadium Designer, To Renovate Dodger Stadium". ^ Smith is best known as the driving force behind the massively influential Oriole Park at Camden Yards. She is also responsible for Turner Field in Atlanta and the recent renovations at Fenway Park. 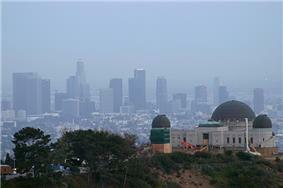 ^ "Not Everyone Shares Roger Goodell's Positive Sentiments Regarding L.A. Stadium Situation". ^ Paulas, Rick (18 May 2011). "An MLB guide to all you can eat". ^ Montano, Al (July 25, 2013). "Cincinnati 5, Dodgers 2: Reds Cool Off L.A.". ^ "2013 Los Angeles Dodgers Media Guide". ^ Shaikin, Bill (July 22, 2010). "Dodgers' Attendance Isn't Always What It Seems".